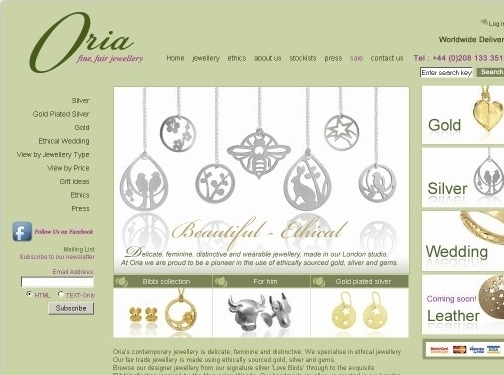 Oria Handmade ethical jewellery makers in London designing their own fair trade contemporary jewellery in silver and gold for weddings and every day. The City of London jewellery designers specialise in the following: silver and gold rings, silver and gold earrings, bracelets, necklaces and cufflinks all in silver or gold. For more information please see the website. UK (London) based company offering fair trade ethical jewellery. Website features e-commerce features, delivery / returns information (under "Terms & Conditions"), press page featuring a large collection of press cuttings, full company contact details.